Sorry to hear about your injury. 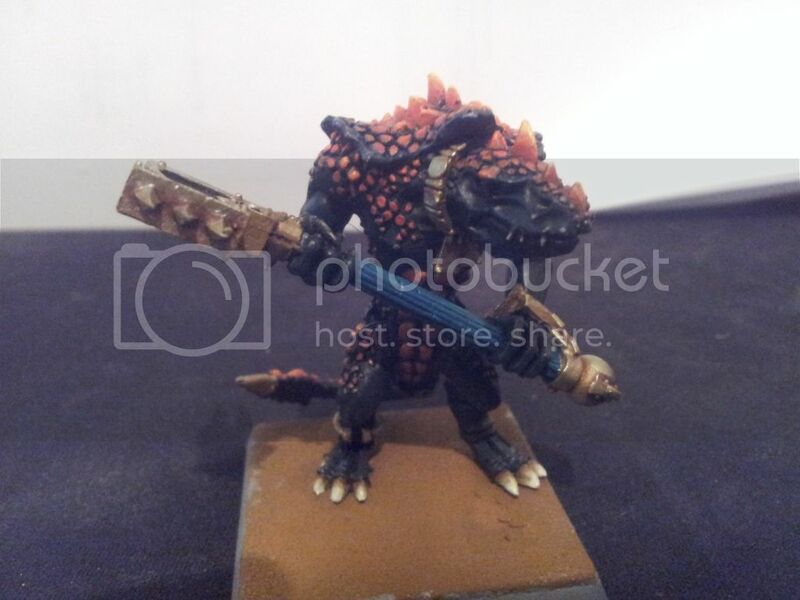 Those Kroxigor look awesome! I can't wait to see more of your army. Thanks Greg, re-reading it now I can't help but feel the whole "life story" bit might have been a slight over the top, but I couldn't honestly think what else to put in the gap I'd labeled "Tell us about yourself". I should be able to get some pics. of the rest up later today though and I'll endevour to not have any bubble wrap this time. I have 2 units of 20 HW+S and then 1 unit of 12 with spears, but the spear unit hasn't been painted yet and just sits with a base coat. 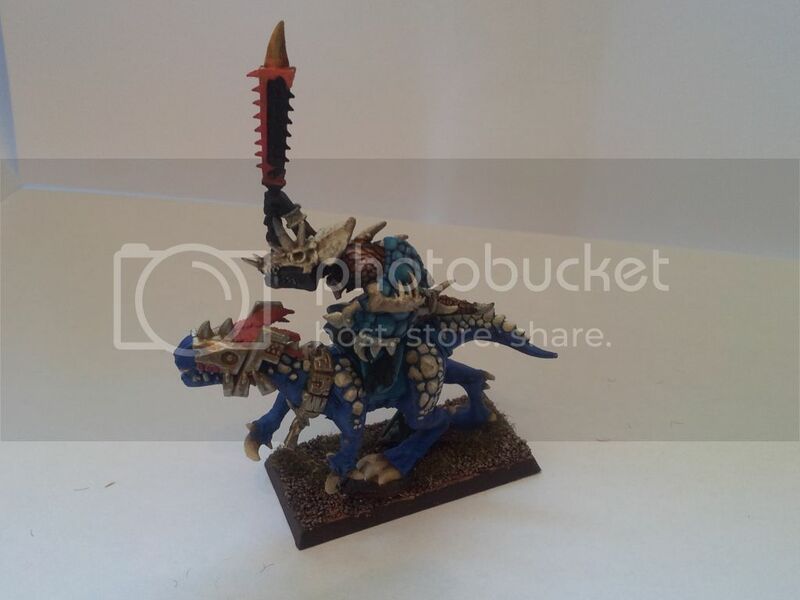 The saurus are not fully assembled when I paint them, I find the crests get in the way so their heads and shields are painted seperatly and then added on afterwards. The back scales are all dry brushed as it's really hard to do a proper fade with the colours as the scales don't stick out very much. The crests are just a standard fade with feathering, I think with the spears I'll make the fades on the back a bit brighter. The shield's took about 12 different runs to get the colour right. Started with Green, then went to white, then blue, back to green and then finally settled on turquoise and then had maybe 3/4 runs to get the technique down. The Scar Vet. is a good old kit bash, I've got a second one with a GW coming but he's not finished yet. 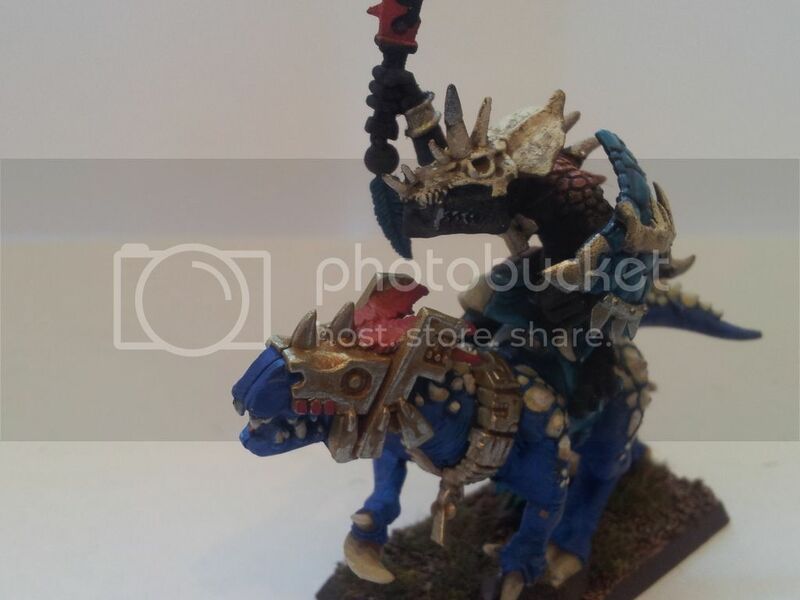 The cold one is painted in the same colours that I use on all my "monsters" for this army. Kit bashing has gotta be the way forward for Scar Vet. personally I can't stand GW's one on Cold ones. The sword is just Burning Blade becuase that's one of my default builds I run on him. Keeping with the same colour palette, I plan to use some completely unique colours on the slan but for Heros they can have the same as everyone else. 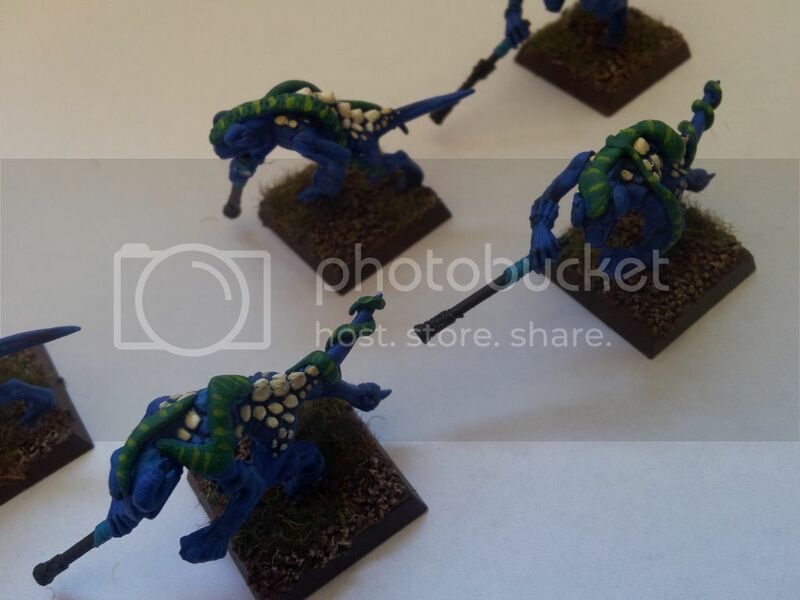 The salamanders were the first monsters I did for this army and their colour scheme is the one I then carried over to the cold ones. 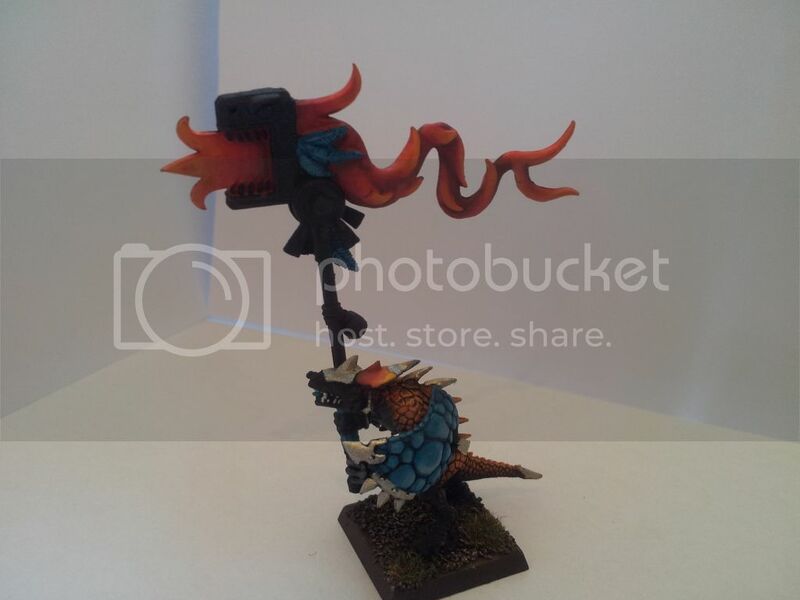 The scheme itself is inspired by a picture of a Razordon I saw on ebay. Seeing as the whole army was Orange/Black I didn't want to do the same for the monsters and I wanted to do something a bit "cooler". I quite like the way the bone/white contrasts and this is just a complete steal as I mentioned before. The bases are just simple slate "borrowed" from my neighbours from garden, they look cool but they are a pain with the models keep falling off. I really need to sort out pinning them down. 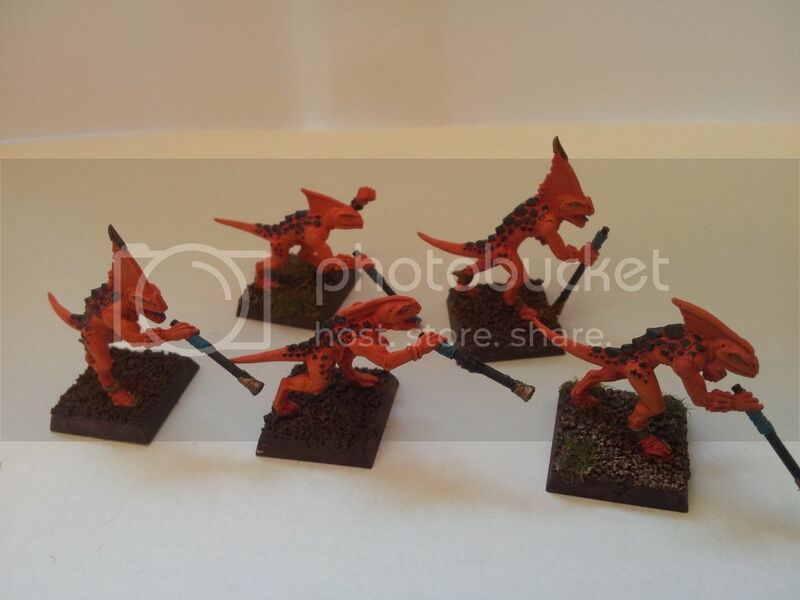 These are my own versions of charmelon skinks, 2 reasons for doing my own, number 1 dont like GWs and number 2 GWs I feel are a bit expensive. Just really basic and bad green stuff. My personal dislike with them is the fact that I havn't managed to work out how to pick out the eyes. 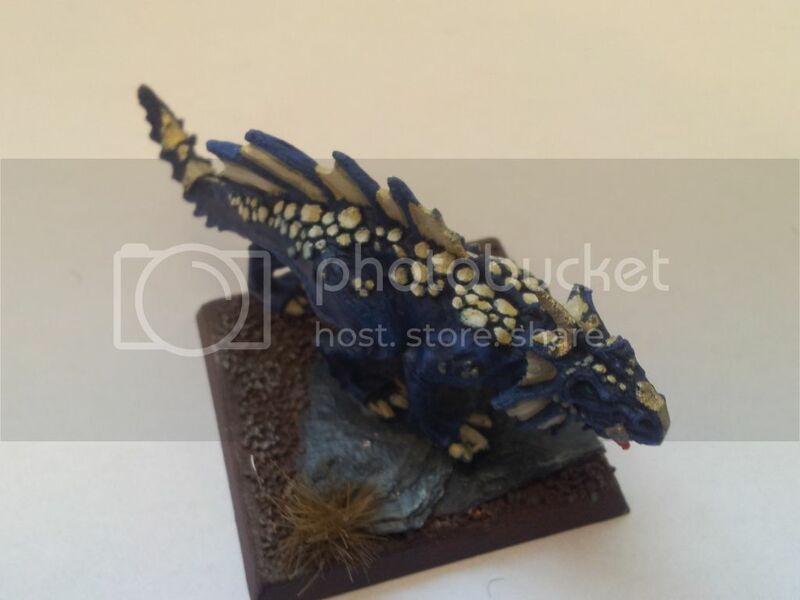 I felt that seeing as they are meant to be a more "rural" version of the skinks I'd give them the same paint job as the jungle monsters. And then the bright green/yellow vines just adds some nice camo and contrast. 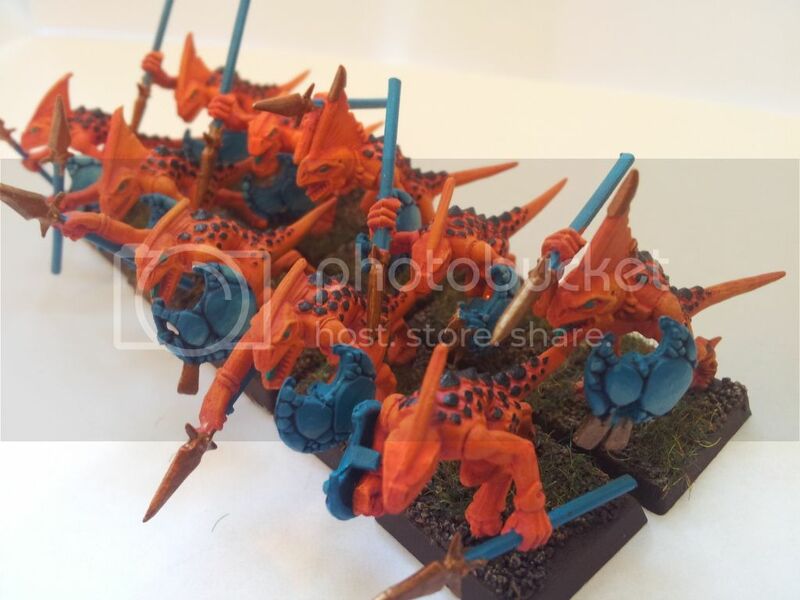 Simple skink skirmishers, the colours are obviously inverted from the saurus and I like the brightness. They are primed white and then washed with seriously watered down red to add the shadow areas. So there are shadows but the model remains bright. 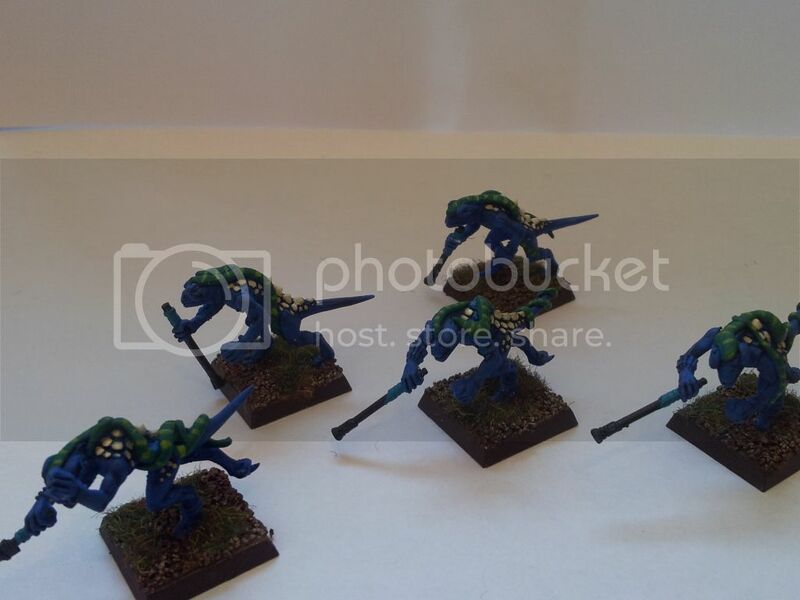 I've removed the hand weapons on all my skinks, I just don't like them and they make ranking up really hard. 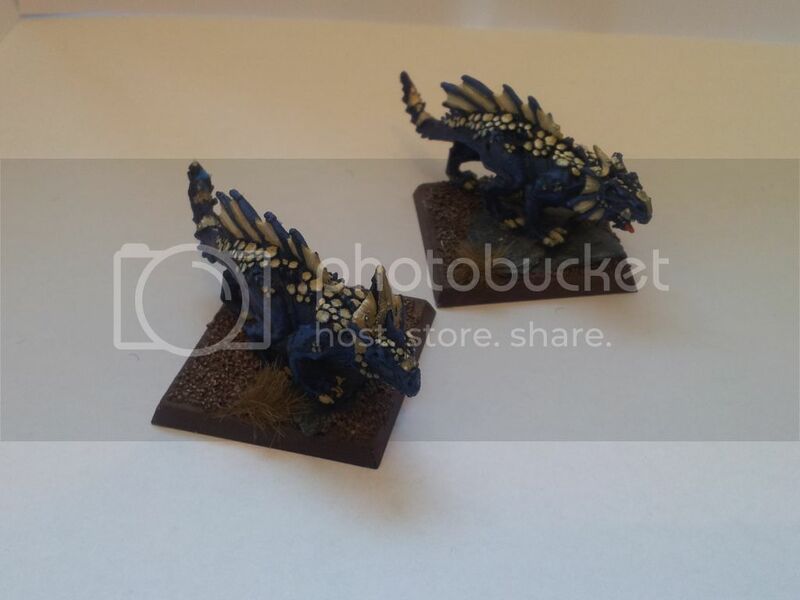 Same paint job as the skinks apart from the high lighting which is properly layered rather than just dry brushed on. The model has been varnished to stop chipping with it does mean that it sometimes catches the light and gives a bit of glare. The idea behind the cloak was just to keep it simple but give it a "smoke" type look, so the model had a theme simular to fire. with the jet black scales being the coal, the skin the flames and the cloak the smoke coming off. 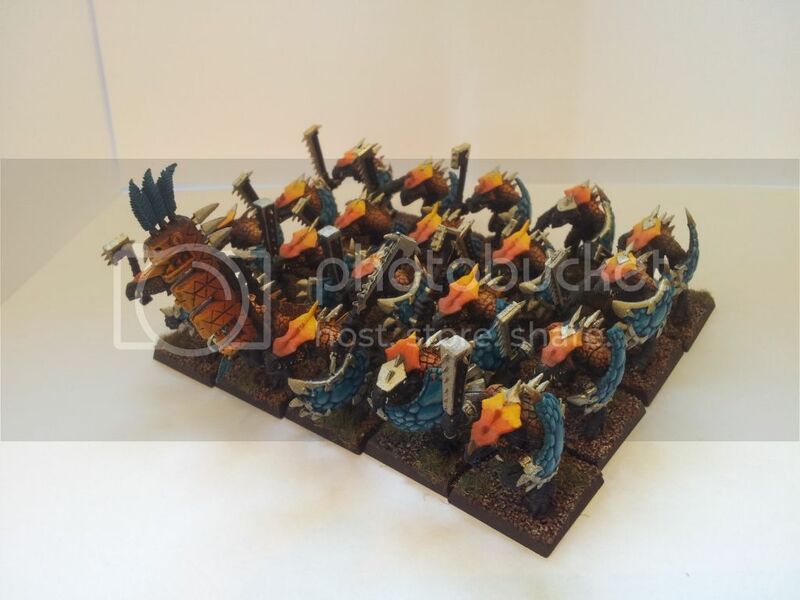 This is 10 of a unit of 30 that goes with the krox. The major issue with them, other than being 30, is trying to paint the scales. Because they are plastic the scales don't stick out much so the black paint has to be quite thick to prevent it from running off into the cracks. I prefer the fade on these shields to the saurus, probably just due to the fact that I've had more practice doing the style by now. But they do become a pain to properly rank up. 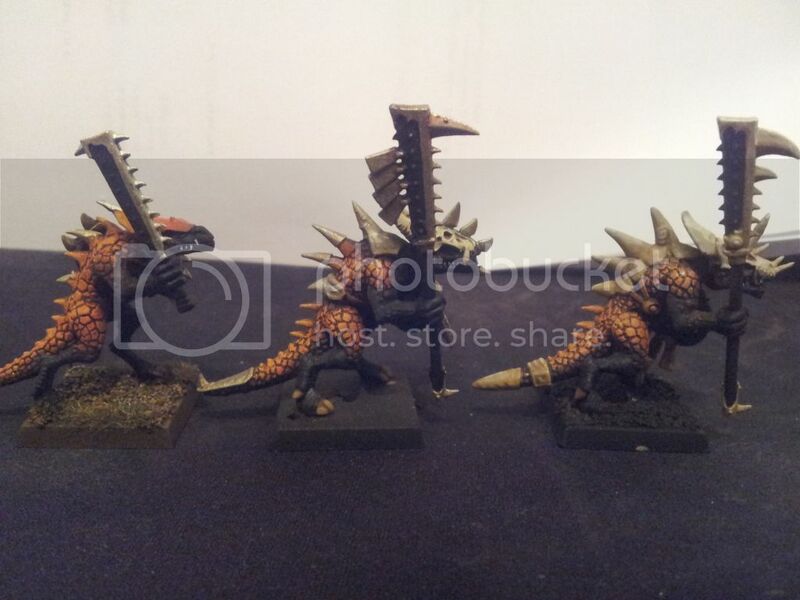 The weapons are also bronze rather than gold, I don't feel that the saurus would feel the skinks are worth gold weapons. 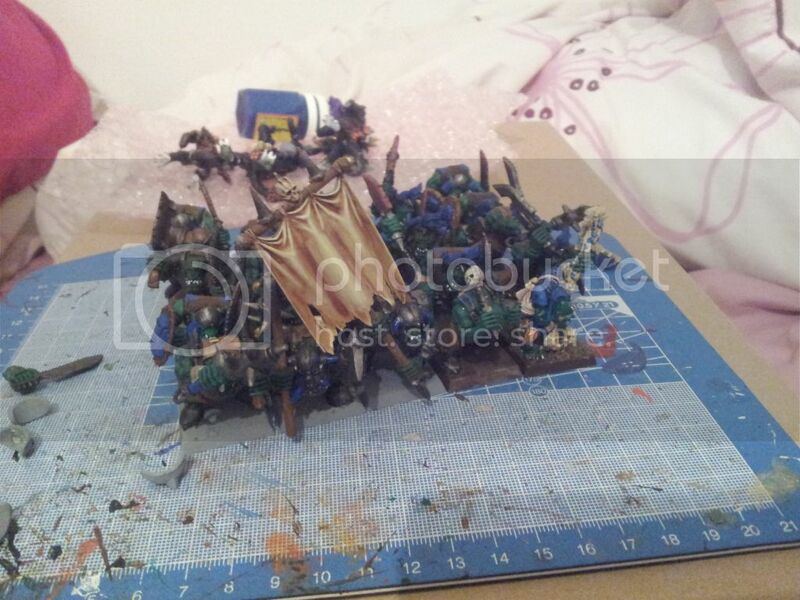 And then finally, not lizards but just some orcs that I found lying around and painted up for the fun of it. Got some goblins coming as well. I selected blue because I didn't want to do the "traditional" red and I couldn't do green either. 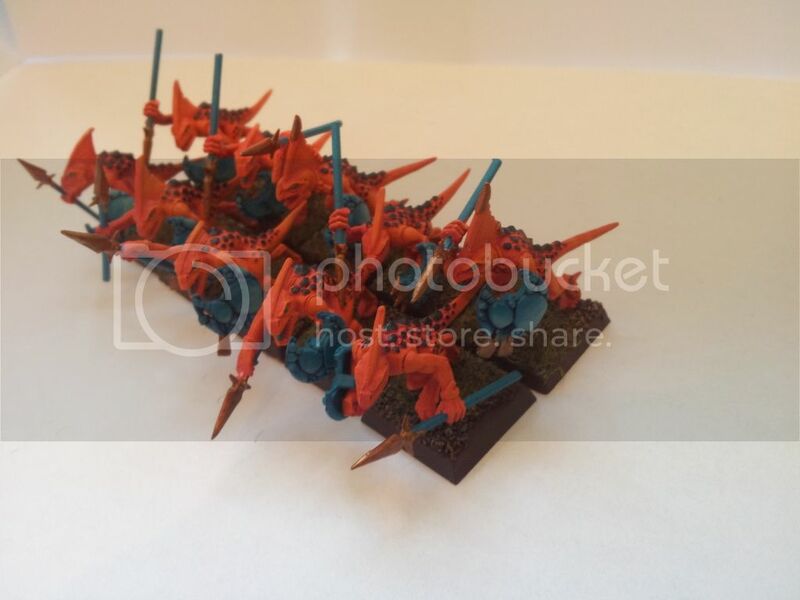 The scheme was originally just used for the shaman on the far right, (I'll add a close up another time) and I liked the bright blue (VJ Icey Blue I believe) for the war paint and the highlights on the staff so I figured to run with it throughout the rest of the unit. I used a good mix of skin tones and techinques with the same idea also being used for their clothes to add some variety. 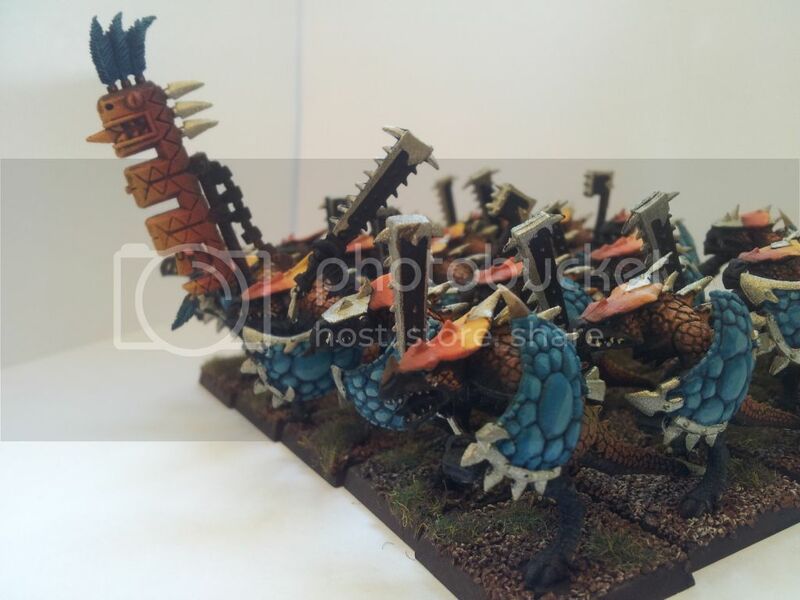 For the Lizards I like the way they are all exactly the same but I really want the Orcs to have that "rabble" effect. I'll try and post stuff as an when it's finished, it should be some N-goblins nexts and then I've got the Kroxigor to finish. I also heard rumours that there was a Purple Slan in the works. Wow, that's a whole lot of models! 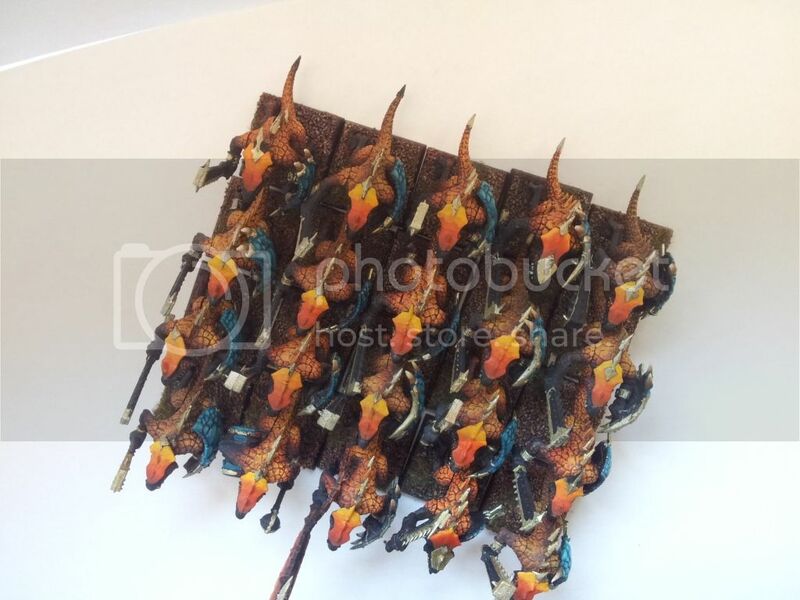 The Lizardmen army looks great. 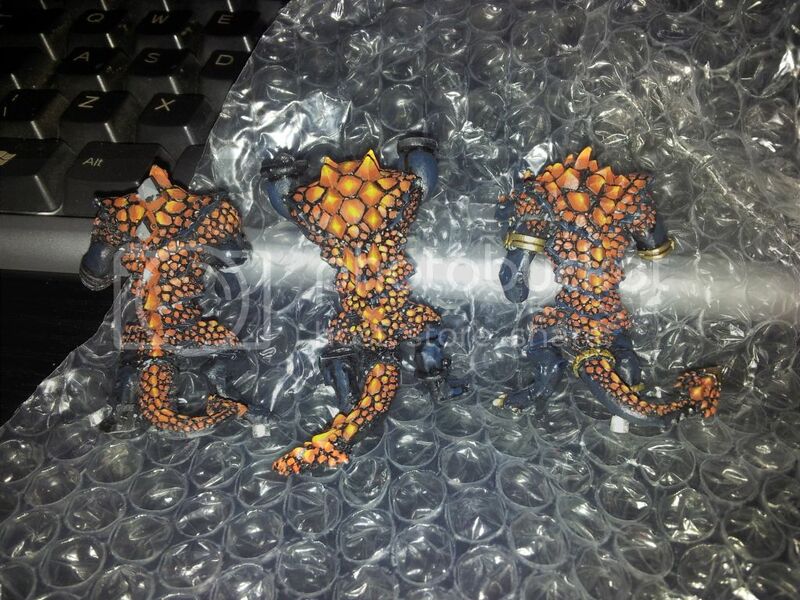 I love the contrast between the "magma" Saurus/Skinks and the "cool" monsters. 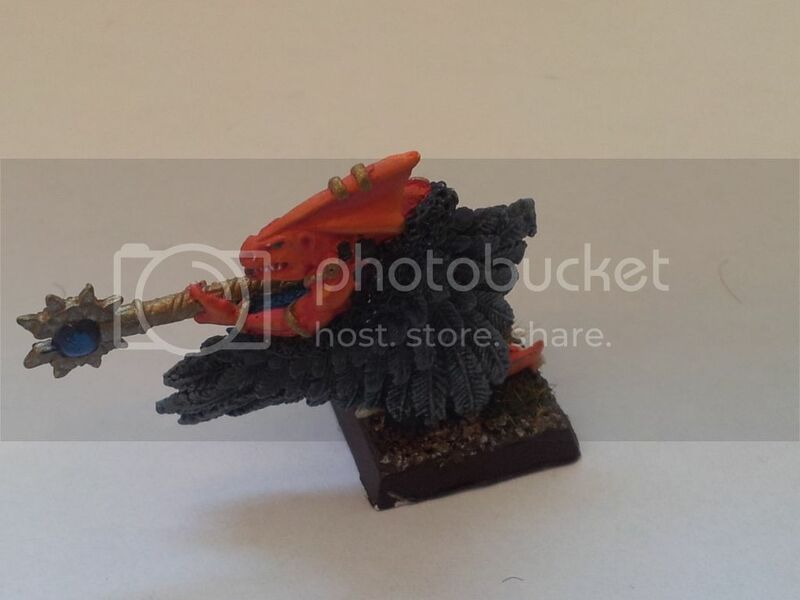 You can feel free to keep posting pics of your models here, or move them over to the "Painting Table" section of the forum. Oh woops, I did intend on posting the above post there but I think I got a bit carried away with replying. Can you move the post to the paiting forum or shall I just repost it when I have something new to show? 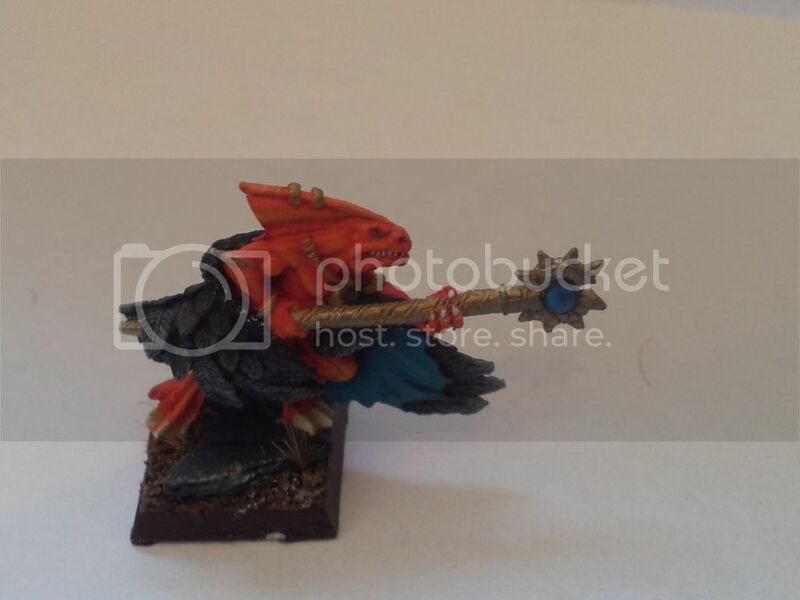 The lizardmen have a cool color scheme. Haha I looked for this thread on the other forum and couldn't find it...spookey :P Thanks for the comment's guys. And thankyou for moving me Greg! Hey all, advice time! 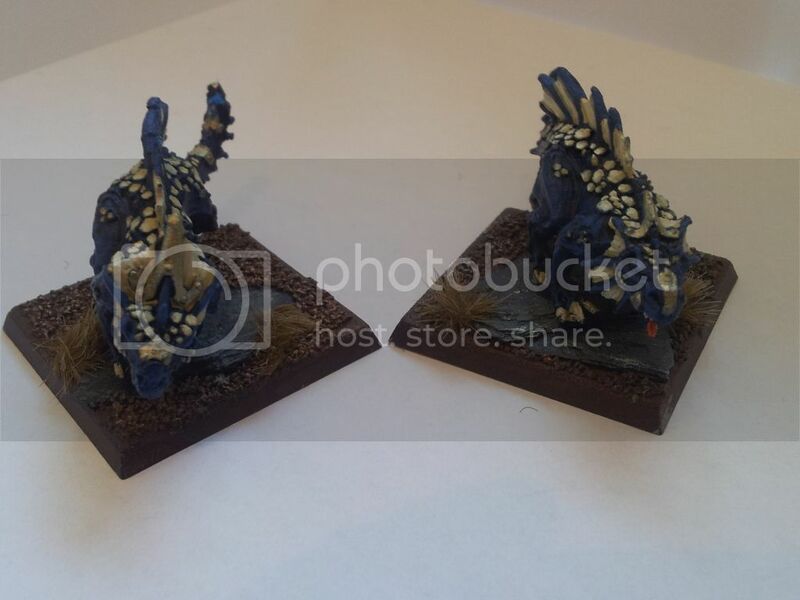 Number 1... Kroxigor bases. I've finished the first one and the base needs to be done? Idea's, suggestions all are appreciated. The above pic. shows a normal saraus, a TG with metalic metal and my attempt at a TG with none metalic metal. The problem I've having is that my TG just look a little bit too much like my saruas for my liking. Suggestions? 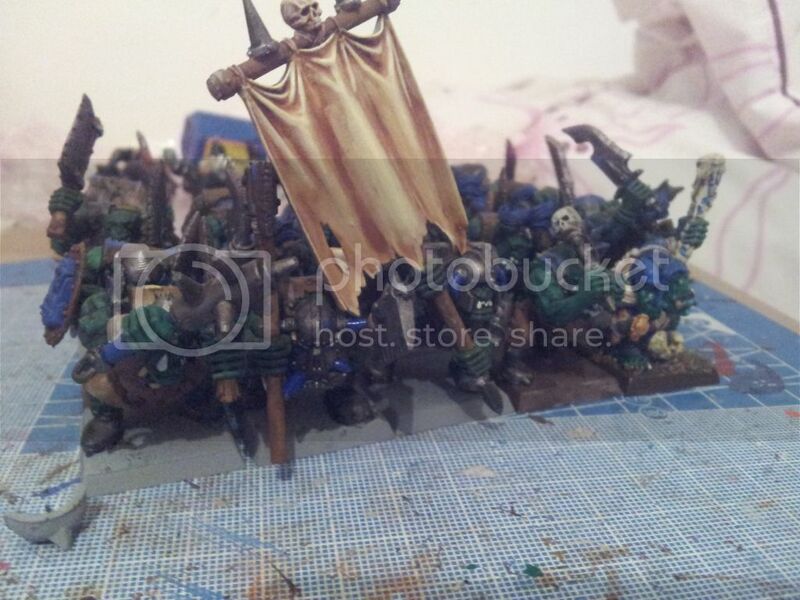 And also any advice on NMM, I think I didn't do quite enough layers on the larger areas. 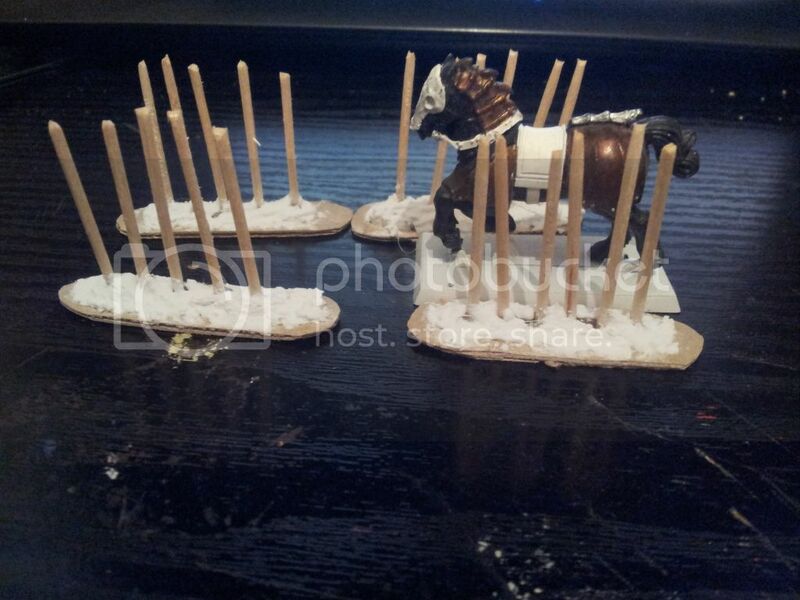 The very first thing I did was these fences, all of the terrain I've made is based off of a couple of old White Dwarf articles, and I mean old (223 and 232 to be specific) and in these they did a couple of piece about making terrain. One of the advantages of it being so old is they are using very basic materials as back then things such as pink foam etc. weren't quite as readily available so most of the things I've used I actually got from Asda, (Walmart for my friends across the pond) and then just bits and bobs that I've got for doing bases. It was a bit of a running joke that my mum got me a glue gun for Xmas, we still aren't quite sure why, but it's prove invaluable while I've been doing this work. The fences are just cocktail sticks cut in half and then stuck down with the glue gun, I've added some filler around them to give them a bit of texture and I'm going to go in with the sand soon. The Old Chaos horse is just for some perspective of size. This is a piece of impassable terrain I made, all the rock's I've used are just picked up straight from the garden or drive way and washed down. The big ones are stuck down with the glue gun where as the little ones are just piled up naturally and then have vast amounts of PVA poured over them. 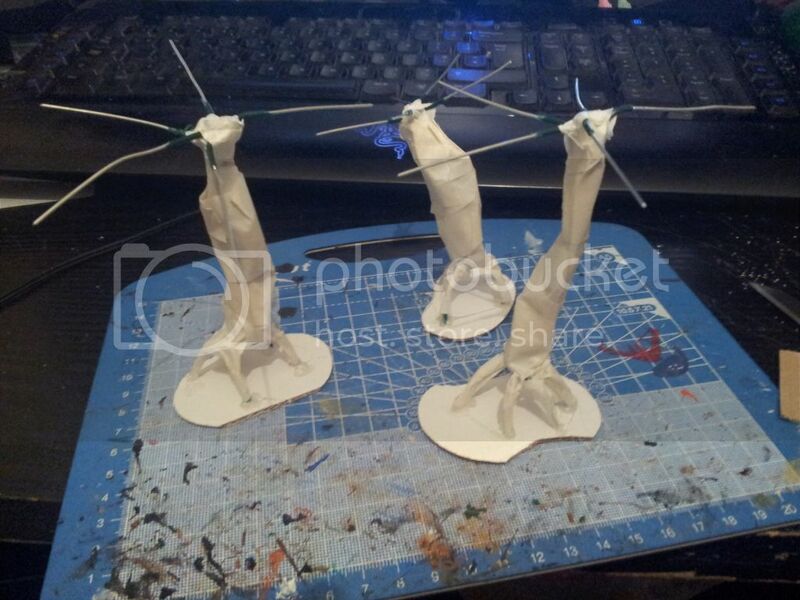 The flock is going to be covered in glue to make it hard and then the whole thing will be primed and painted. This is a piece of difficult or just random terrain, the idea as you can probably guess is to make the flats up as stone slabs. 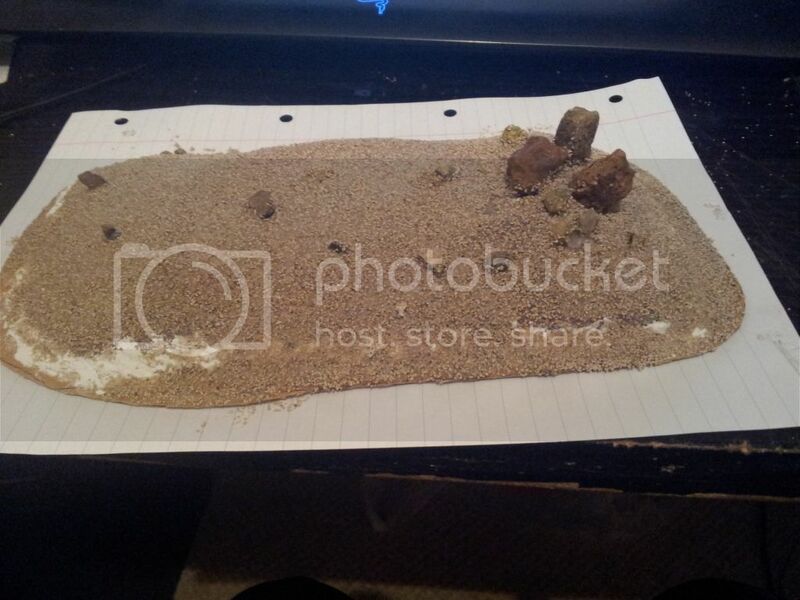 Still needs a bit of work done on it, the slabs are just thin cardboard stuck down with PVA, I might in future use slightly thicker cardboard for this. This is my first hill, I'm rather proud of it actually hehe. It's made from a piece of "foam"? which I stole off my mum, it's used for flower arrangements normally. But it works fine for this apart from the fact that it absorbs water, so getting it sanded was quite hard. 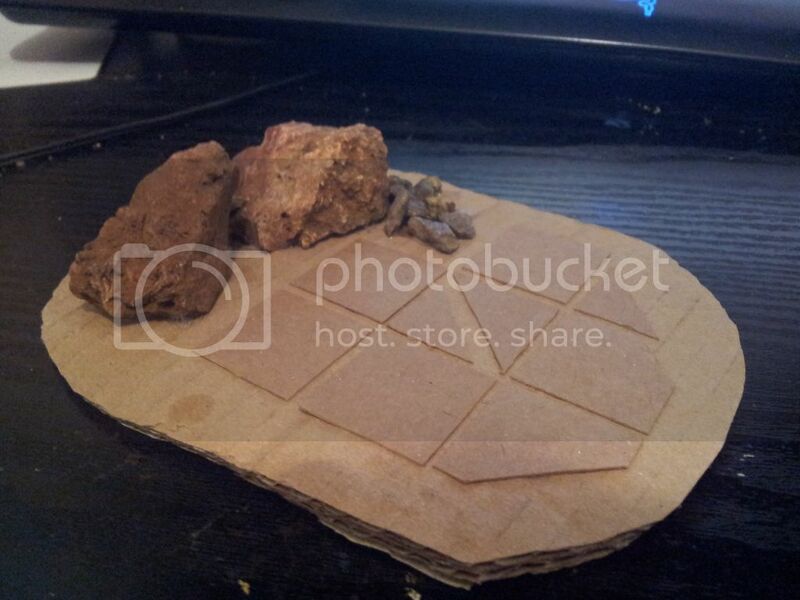 Again the rocks are just pushed in and then glue gunned. The white bits are just filler to hide some caps. 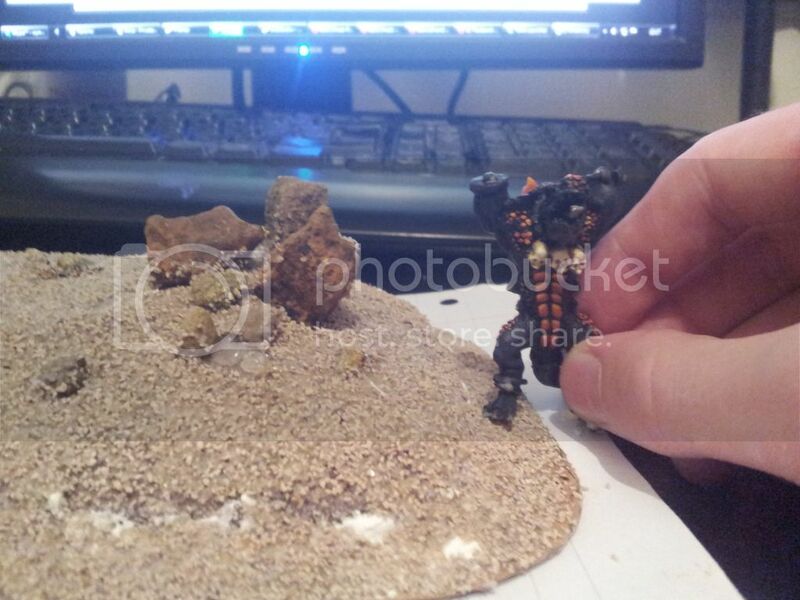 And the terrible Kroxigor is just for height, my krox are still very much WIP. 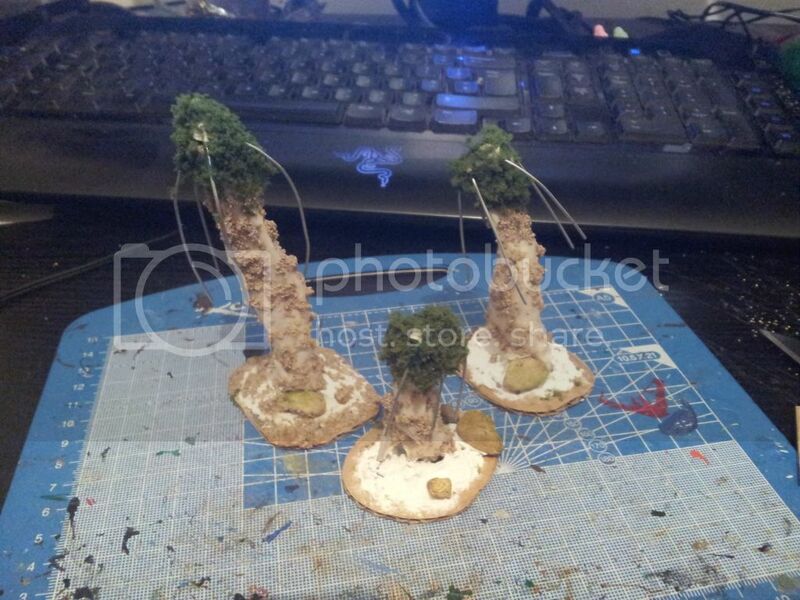 This tree technique is straight from the white dwarf, first you use green covered garden wire and just wrap it into a tree type shape with bits at the top for stems and bottom for roots. Then super glue to make sure it holds. Then next step is shown here when masking tape is wrapped around the lot and then I've glue gunned it down onto some card for bases. This is a couple of steps on with some other trees I did earlier. The trees have been covered with a mix of sand, water and PVA and then bases have had filler all over them and then some larger stones glue gunned on. 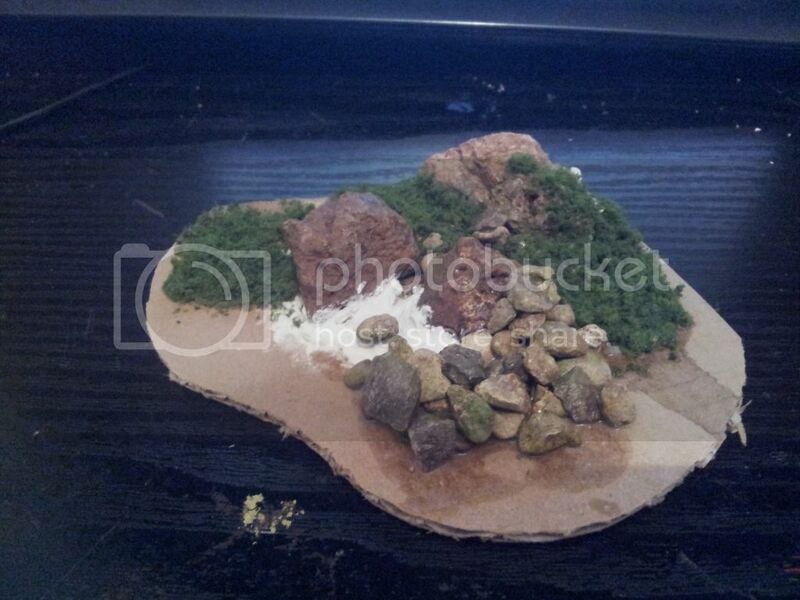 At the tops to hide the wires and just add a bit of substance I've put on 2 layers of coarse flock from Model scenics. In the future I'm going to use their bush flock I think. The plan is to cover them in PVA and paint them. That's all for now fokes, apologies for not having any painting but well...I havn't painted anything recently. 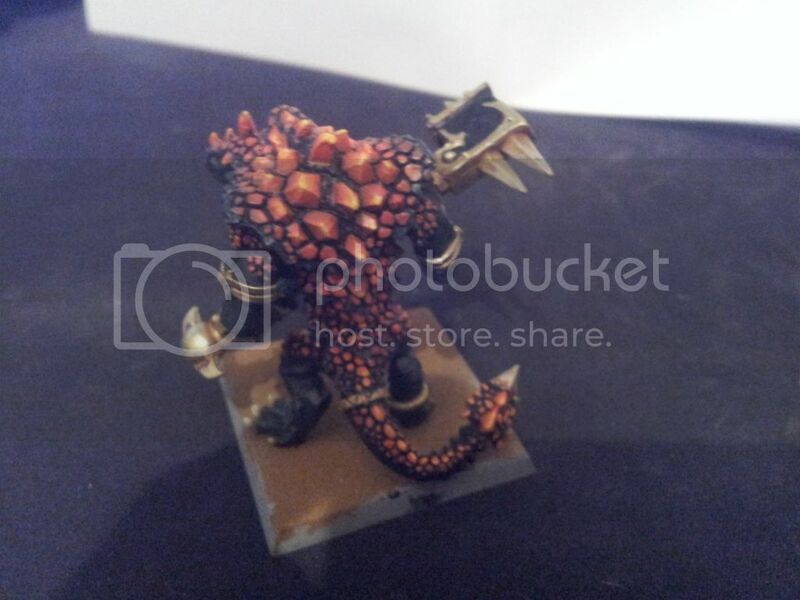 I'll at least try and get something painted soon, even if it's just some gobbos.